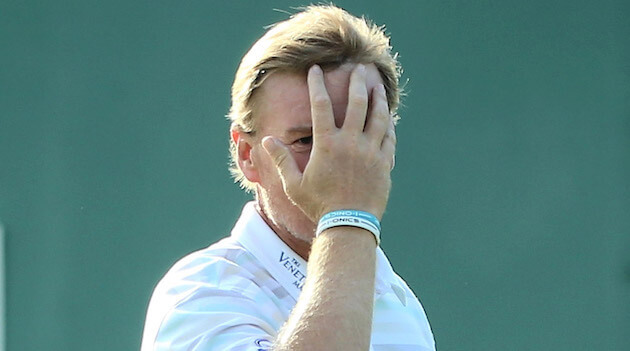 [WATCH] Ernie Els misses a ONE FOOT putt. We all hit a poor shot from time to time but this is the WORST putting stroke ever! It’s hard to believe the player featuring in this horror story is none other than 4-time-major winner, Ernie Els. A player known for owning the silkiest swing in golf and a player that previously possessed an enviable touch on and around the greens. The scene of the crime was at Carnoustie while playing in The Dunhill Links which started Thursday. So watch, if you can, a world-class player not even hit the hole from one foot. Also, keep an eye on his right hand during the stroke, a hate to even mention the word ‘yips’ but that doesn’t look good. Fortunately Els kept it together and didn’t react like this young fellow. 15 of the HOTTEST Celebrity Golfers.